Instead of having to use tons of crushing force and volcanic heat to forge diamonds, researchers at Case Western Reserve University have developed a way to cheaply make nanodiamonds on a lab bench at atmospheric pressure and near room temperature. The nanodiamonds are formed directly from a gas and require no surface to grow on. The discovery holds promise for many uses in technology and industry, such as coating plastics with ultrafine diamond powder and making flexible electronics, implants, drug-delivery devices and more products that take advantage of diamond’s exceptional properties. Their investigation is published today in the scientific journal Nature Communications. The findings build on a tradition of diamond research at Case Western Reserve. Beyond its applications, the discovery may offer some insight into our universe: an explanation of how nanodiamonds seen in space and found in meteorites may be formed. The process for making these small “forever stones” won’t melt plastic so it is well suited for certain high-tech applications. Diamond, renowned for being hard, has excellent optical properties and the highest velocity of sound and thermal conductivity of any material. Unlike the other form of carbon, graphite, diamond is a semiconductor, similar to silicon, which is the dominant material in the electronics industry, and gallium arsenide, which is used in lasers and other optical devices. While the process is simple, finding the right concentrations and flows—what the researchers call the “sweet spot”—took time. The other researchers involved were postdoctoral researcher Ajay Kumar, PhD student Pin Ann Lin, and undergraduate student Albert Xue, of Case Western Reserve; and physics professor Yoke Khin Yap and graduate student Boyi Hao, of Michigan Technical University. Sankaran and John Angus, professor emeritus of chemical engineering, came up with the idea of growing nanodiamonds with no heat or pressure about eight years ago. Angus’ research in the 1960s and 1970s led him and others to devise a way to grow diamond films at low pressure and high temperature, a process known as chemical vapor deposition that is now used to make coatings on computer disks and razor blades. 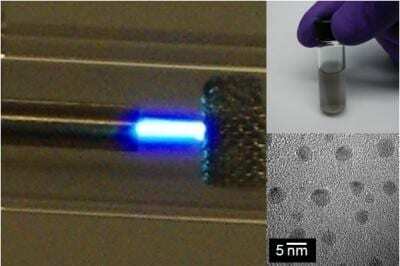 Sankaran’s specialty, meanwhile, is making nanoparticles using cool microplasmas. It usually requires high pressures and high temperatures to convert graphite to diamond or a combination of hydrogen gas and a heated substrate to grow diamond rather than graphite. After several ups and downs with the effort, the process came together when Kumar joined Sankaran’s lab. The engineers produced diamond much like they’d produce carbon soot. They first create a plasma, which is a state of matter similar to a gas but a portion is becoming charged, or ionized. A spark is an example of a plasma, but it’s hot and uncontrollable. To get to cooler and safer temperatures, they ionized argon gas as it was pumped out of a tube a hair-width in diameter, creating a microplasma. They pumped ethanol—the source of carbon—through the microplasma, where, similar to burning a fuel, carbon breaks free from other molecules in the gas, and yields particles of 2 to 3 nanometers, small enough that they turn into diamond. In less than a microsecond, they add hydrogen. The element removes carbon that hasn’t turned to diamond while simultaneously stabilizing the diamond particle surface. The diamond formed is not the large perfect crystals used to make jewelry, but is a powder of diamond particles. Sankaran and Kumar are now consistently making high-quality diamonds averaging 2 nanometers in diameter. The researchers spent about a year of testing to verify they were producing diamonds and that the process could be replicated, Kumar said. The team did different tests themselves and brought in Yap’s lab to analyze the nanoparticles by Raman spectroscopy. Currently, nanodiamonds are made by detonating an explosive in a reactor vessel to provide heat and pressure. The diamond particles must then be removed and purified from contaminating elements massed around them. The process is quick and cheap but the nanodiamonds aggregate and are of varying size and purity. The new research offers promising implications. Nanodiamonds, for instance, are being tested to carry drugs to tumors. Because diamond is not recognized as an invader by the immune system, it does not evoke resistance, the main reason why chemotherapy fails. Sankaran said his nanodiamonds may offer an alternative to diamonds made by detonation methods because they are purer and smaller. The group’s process produces three kinds of diamonds: about half are cubic, the same structure as gem diamonds, a small percentage are a form suspected of having hydrogen trapped inside and about half are lonsdaleite, a hexagonal form found in interstellar dust but rarely found on Earth. April 5, 2019 - Large scale 3D printing and nanodiamonds contribute to UPM sustainability drive 3D Printing IndustryFinnish alternative energy and material company UPM, and its subsidiary UPM Biocomposites have demonstrated the potential of large-scale 3D printing.